I first visited St Petersburg 50 years ago. Then it was called Leningrad. In the summer of 1960, twelve of us—medical students—travelled in three elderly cars through Scandinavia to Russia. It was the first year that foreigners had been allowed to travel easily to the USSR. In Leningrad we stayed in a newly established camp-site on the edge of the town. What struck me then about Leningrad was its magnificence. The Winter Palace was more grand, more opulent, more gilded, more awe-producing, than any place I had ever seen. So this is why the revolution started here, I thought. This year I visited St Petersburg for the second time. I saw that, although as a twenty-year-old I knew practically nothing, my first impression was not inappropriate. There are some churches that are interesting and the university buildings are good, but architecturally in St Petersburg, it's palaces and palaces. They're everywhere. The most important new book I read last year was Richard Wilkinson and Kate Pickett's The spirit level: Why more equal societies almost always do better. It shows how, once a nation has reached a certain level of income among its citizens (which Europe and North America have reached but which most Third-World countries have not), it's not the absolute level of average national income that predicts health and well-being. It's difference in income within the society: not economics but psychology. Japan and Sweden have a difference between their top 20% of incomes and their bottom 20% of about four to one. Respectively, UK and the USA have differences of seven to one and eight to one. The more inequality of income within each nation, the worse the whole range of health outcomes from child mortality to adult longevity. The more inequality, the higher the murder rate and number of people in prison. The more inequality, the lower the level of trust and happiness in society. In St Petersburg, what the palaces shout is: "Inequality." So, in St Petersburg, I visited the street in which Fyodor Dosteyevsky lived, and the street that crosses it in which he sets the lodging of Rodion Raskolnikov, his protagonist in Crime and Punishment. My guidebook says that in Dostoyevsky's time this area was known for drunkenness, squalor, and destitution. When Dostoyevsky lived here, he and his brother published the literary magazine Vreyma (Time) and then another Epokha (Epoch). Dostoyevsky is often described as the literary novelist with the most intense interest in psychology. I wonder whether our magazine, OnFiction—literary and psychological—might not in some way be a successor to his magazines. In the street in which Raskolnikov lived, I went into a grocery to buy some bottled water (tap-water in St Petersburg is not safe to drink). The grocery was not exactly sordid, but it was crowded with people who had about them marks of poverty. As I entered. a man of short stature, ragged, unwashed with a bedraggled beard, pushed past and scowled at me. In the line at the checkout he was in front of me. His purchase was a half-bottle of vodka, for which he counted out 104 rubles (about three dollars). Raskolnikov's street is not as squalid as it was in Dostoyevsky's time but it's certainly not grand. I noticed seedy-looking drinking places in basements, and I remembered Raskolnikov having a conversation in a place of this kind. 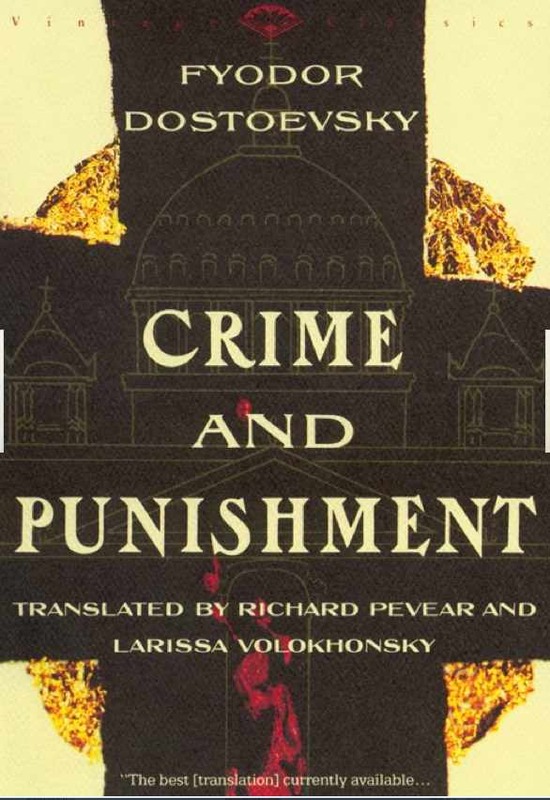 Crime and Punishment is one of the most moving novels I have read. In it, Dostoyevsky portrays envy, bitterness, shame, and self-deluded aspiration. It's not difficult to imagine the places and contexts of such emotions today—and not just in Russia. Fyodor Dostoyevsky (1866). Crime and punishment (Richard Pevear & Larissa Volokhonsky, Trans.). New York: Vintage (Current edition 1993). Richard Wilkinson & Kate Pickett (2009). The spirit level: Why more equal societies almost always do better. London: Allen Lane. Thank you, Keith. I enjoyed this post very much. I read a few of Kundera's novels in English after I had visited Czechoslovakia, but before I had lived in Central Europe for an extended period. My ability to imagine as I read Kundera’s novels changed after twelve years in Bratislava, and half a year in Prague. Palaces virtually scream out “inequality”—yet I recall once being part of a guided tour of a palace where the guide’s prepared speech seemed designed to distract us from the privileges the residents had enjoyed, and to convince us that the noble residents were just ordinary folks like you or me. Thanks very much, Mark, for this comment. I have not lived in Eastern or Central Europe, only visited. But the area does interest me a lot. Among the places I have visited is Prague, and I have been there twice. As I mentioned before, in a previous e-conversation with you, I am thinking of re-reading The unbearable lightness of being. And as to inequality, there is indeed a great deal of it about, some shouting, some being kept rather more quiet.